When a professional sports team wins the championship, their city welcomes them home with a ginormous victory celebration. What cracks me up is when the city’s citizens decide to trash their city after the big win. That has never made sense to me! Such as, when the Lakers won the championship this year, there were people looting stores and shops, boneheads demolishing cars by jumping on the hoods, and some whack-jobs trying to take on the police. Without the violence and barbarian-like behavior, Saul and David are also welcomed home from war with a celebration. Jealousy is a mega-theme in Scripture. There are actually two different styles of jealousy. One is when you get protective over something of yours that is not being faithful to you. This is the righteous jealousy in the Bible ascribed to God. The second kind of jealousy is when you resent someone for having something you think you deserve. This is the sinful jealousy of Saul towards David. Jealousy is a prideful and hateful sin driven by Satan that always leads to deeper sin if not repented of. 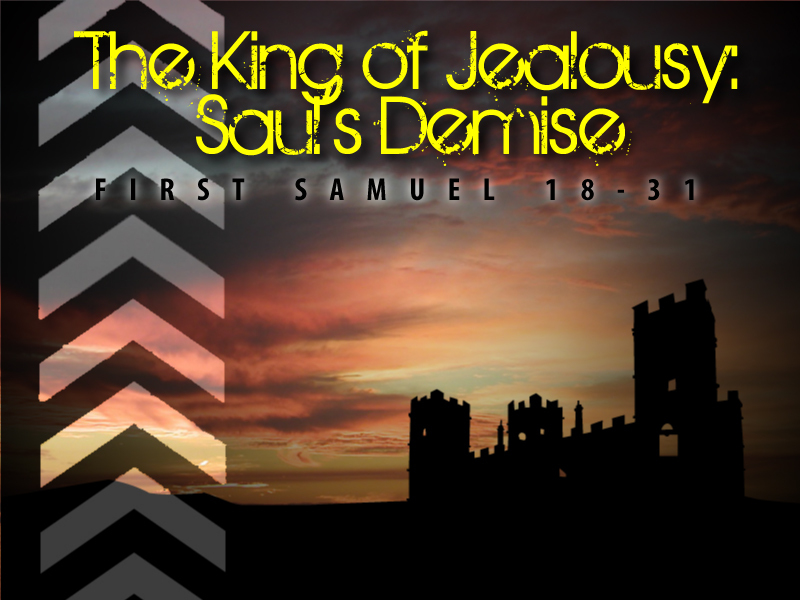 Saul was resented, and he hated David so much from his jealousy that he tried to kill David many times. In two of those times, David had a clear shot at Saul and could have killed him (1 Sam 24, 26), but David didn’t because he feared God most. When we live for Christ, people will hate us out of jealousy because of our loving family, close friends, pure lives, joyful happiness, etc. But we must show them mercy, grace, and love even if they resent us in a hurtful and threatening way. Saul’s jealousy didn’t just drive him to attempted murder, but it also drove him to a deeper and more evil sin – witchcraft. Saul went to the Witch of Endor who got freaked out herself when the spirit of Samuel really rose! She was probably expecting to fake it or bring up a demon. People who result to witchcraft are rapidly moving down a very evil and dangerous road. Beware! When we struggle with jealousy driven by Satan, we are ultimately jealous of Jesus. Instead, we must be willing to step back to see all we have belongs to Him!